Developing upon the highly regarded Nexa Autocolor EHS Turbo Plus paint line, he new commercial transport offering, Turbo Vision offers significant enhancements through innovation, process optimisation and colour excellence; whilst also being fast-drying, easy to apply and a durable gloss and finish. Turbo Vision is using a brand new generation of patented technologies and has been designed to reach new levels of performance, process optimisation and colour excellence. 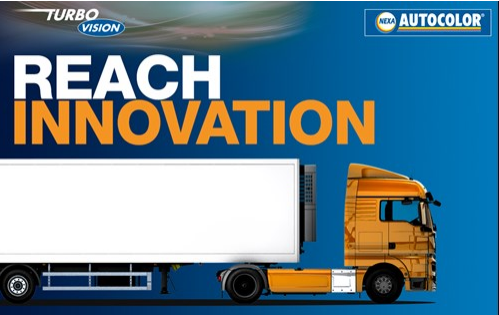 Covering all the needs of the Commercial Vehicle Industry – from repairers, builders to special manufacturers – the easy application and fast drying times deliver a premium finish that is sure to impress! The excellent flow and best-in-class colour matching has been at the centre of research when developing the platform, and with different types of vehicles and parts demanding different performance characteristics, a comprehensive range of binders (High Flow, Matt, Structured, Medium Solid and Direct-to-Metal) have been developed to combine with the new premium toners. Using Turbo Vision’s unique Premium High Flow Binder results in enhanced coverage and improved opacity. Ease of application and lower material consumption both contribute towards a 10-15 per cent reduction in VOC emissions, resulting in healthier working conditions for painters whilst lowering the environmental footprint for manufacturers and paintshops. As an easy-to-use paint process combined with accurate mixing and efficient colour matching, Turbo Vision offers shorter baking times and less re-work. Both experienced painters and trainees alike, will benefit from faster, accurate and reliable results. The covering properties means on average a 10-15 per cent material saving and a 25 per cent bake time reduction. Turbo Vision’s general appearance and long term durability exceeds other coating systems. Its colour stability allows painters to confidently and consistently achieve colour mixing and perfect results every time. PPG Refinish UK will be exhibiting at the Commercial Vehicle Show, Birmingham NEC in April promoting the new Nexa Autocolor Turbo Vision platform. Visitors can find out more from the team at stand 4E80 and view first-hand the results of this amazing new system.